Canada is home to over 1 million people with Ukrainian heritage. This makes it the third most populated country behind Ukraine and Russia as the home to Ukrainians. It is not surprising that there are a lot of interactions and partnerships at the political, corporate, and personal level. This results in thousands of documents being exchanged between the two countries every year for various purposes. Canadian businesses may require documents such as a Certificate of Incorporation, Articles of Incorporation, Corporate Power of Attorney, or a CRA certificate of tax residency to be used in Ukraine, whereas Ukrainian Canadians may need to use their divorce judgement, birth certificate, power of attorney, or Canadian University Degrees in Ukraine. However, it is not as simple as merely sending these Canadian documents to Ukraine. Before they can be accepted as valid there they must go through a process of verification to ensure they are authentic and real. You may have been told to get your Canadian documents apostilled. However, since Canada has not signed the Hague Apostille convention, any Canadian documents that need to be used in Ukraine must go through the original process of authentication and legalization. This process is equal to an apostille and is recognized as such by Ukraine. Authentication and legalization seems simple at first glance. It is a two step process that focuses on verifying a signature on a document. The first step of authentication takes place at Global Affairs Canada, who will only sign and stamp a Canadian document if it meets their necessary requirements. The second step of legalization takes place at the consular section of the embassy of the country where the documents will be used. In this case, legalization of your Canadian document will need to take place at the consular section of the Ukrainian embassy here in Ottawa, Canada. Prior to legalization, you will have to provide a series of additional documents as well as a payment for processing. These requirements as well as the payment change multiple times in a year. Authentication at Global Affairs Canada can take over one month (20 business days) and the Ukrainian embassy has its own processing time. This is in addition to the time it will take to ship your documents to and from Global Affairs Canada as well as the Ukrainian embassy. As you can see, authentication and legalization of your Canadian document for use in Ukraine can take a very long time and this is even if you get everything right the first time which seldom occurs. When there are deadlines to meet, this long and uncertain processing time is simply not an option. Thankfully, there is a simple solution: ALSC. Authentication Legalization Services Canada; over 25 years ago we became the first providers of this service. Since then, we have maintained our position as the best in our industry and have developed a process that has become the industry standard. We are experts in all Canadian documents for use abroad, whether personal or corporate. On our priority same day authentication service we can save you almost 20 days of processing time by having your documents authenticated the same day they arrive at our office. We also offer a cost effective standard 3 business day authentication service and an economy 10 business day authentication service convenient for those who need to process numerous documents. Either way, you save time. 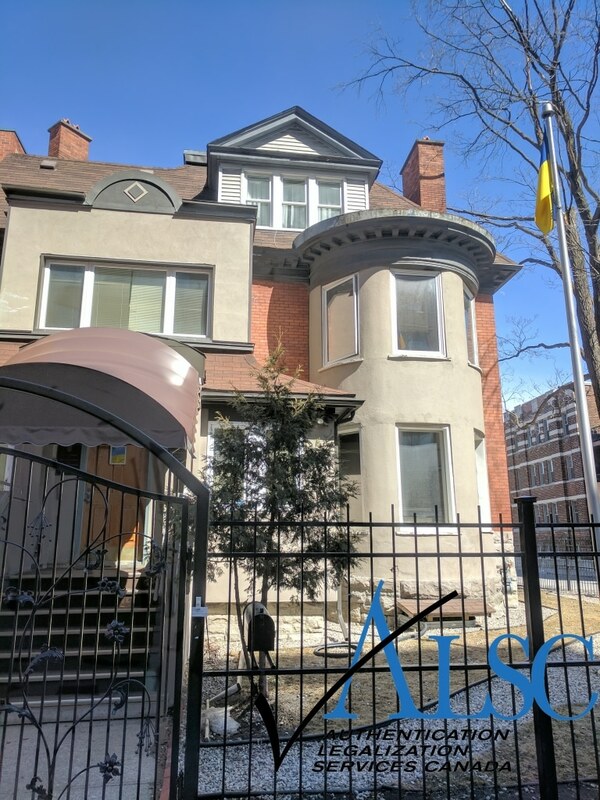 Upon completion of authentication, one of our agents will personally present your documents on your behalf to the consul at the Embassy of Ukraine here in Ottawa. Although we cannot influence the processing times of foreign embassy consulates, our service guarantee means we ensure your documents will be valid for use in Ukraine. We are always up to date on their changing requirements and prepare our documents to their specifications to secure a fast and seamless legalization process. As our client you will have your own personal agent to assist you in preparing your documents for authentication and legalization. They will also provide you with detailed updates at every step of the way, answer any questions, and address any concerns you may have throughout the process. This means minimized delays and maximum efficiency and speed. If you have Canadian documents that need to be used in Ukraine, contact us. Continue reading for more details on some Canadian documents commonly required for use in Ukraine, how you can get them, and how we can help you. Canadian University Degrees, transcripts, and diplomas are some educational documents that will be requested from you for use in Ukraine. This can be for multiple reasons related to employment and further education. Since graduating is a great achievement, its likely you have your degree somewhere in an accessible location. If this is the case, your degree is good to go as almost every degree and its accompanying transcripts contain signatures recognized by Global Affairs Canada. This means they can be authenticated without additional processes such as notarization by a notary public or lawyer, and can then be legalized at the Ukrainian embassy. However, using your original degree, diploma, or transcripts is not always the best option as you may want to keep your original degree with you and in good condition. Additionally, most degrees are quite large which means they are expensive to ship, and are inevitably more prone to damage as they are handled by shipping couriers and embassy staff. Luckily, the Ukrainian embassy does not require the original degree for processing. This means your best option will often be to make a notarized copy of your degree. This may save you money in shipping and keep your original in excellent condition. Before you do this, make sure you check with the requesting party in Ukraine if a notarized copy will suffice. If you would like, we can make a notarized copy for you when you use our services. We provide speciality shipping envelopes for all our clients that keep your degrees and documents safe, regardless of the service speed and free of charge. If you do not currently have your degree, or if it is damaged beyond use, you may be able to order a certified or reissued copy directly from the university which issued your original degree by using the links below. We recommend you have your degree shipped directly to our office if you must order a new one. Many of our clients choose to do this as it saves a lot of time especially if you are not currently residing in Canada. Canadian vital statistics documents such as birth certificates, marriage certificates, and death certificates are commonly requested for personal affairs in Ukraine. These can be requested for a number of reasons, ranging from citizenship and immigration to the inheritance of an estate. The signatures on Canadian birth certificates, marriage certificates, and death certificates are recognized by Global Affairs Canada which makes them ready for authentication. It’s important to know that no short form versions of these documents will be accepted for authentication. Another document that is occasionally requested along with a Canadian vital statics document is a divorce certificate. Whereas Canadian vital statistics documents are issued by the province wherein the life event occurred, divorce judgements and divorce certificate are issued by the court at which the divorce was finalized. As such, if you do not currently have your divorce judgement or certificate, contact the court where it was finalized. If you do have it, make sure it has been properly certified by the court and that the stamp, seal, and signature are match and are legible. If not, contact the court which issued your document. Global Affairs Canada will need to know the name of the signatory in order to authenticate your divorce judgement or divorce certificate. If you need your Canadian birth certificate, marriage certificate, or death certificate for use in Ukraine, you can them by using the appropriate links below. If you choose to do this, you can have your Canadian vital statistics document sent to our office to speed up your processing time. A power of attorney is another document which you may require for use in Ukraine along with your Canadian vital statistics document. If you have your power of attorney with you already, check to make sure it has been notarized by a Canadian lawyer or notary public and that the stamp, signature, and seal are all visible and match. You will need this for your Canadian power of attorney to be authenticated at Global Affairs Canada. If you still need to get your power of attorney, most lawyers can draft one for you or you can even find templates online and complete them yourself. Note that you will still have your power of attorney notarized for it to be valid for authentication at Global Affairs Canada and subsequent legalization at the Ukrainian embassy. As Ukraine continues to open its doors to foreign corporations, many Canadian businesses are looking to plant their flag in Ukraine’s growing marketplace. Whether its to partner with a Ukrainian business, open or expand subsidiaries, or export Canadian-made products, there are a series of corporate documents that will be required for use in Ukraine. These include corporate powers of attorney, CRA certificate of tax residency, Certificate of Incorporation, Articles of Incorporation, and many others. The exact documents you will need will depend entirely on what has been requested of you by your associates in Ukraine. As an existing Canadian corporation, you should have most of these documents on file or know how to get them. Some documents such as corporate powers of attorney can be drafted by lawyers at an additional cost. Note that all of your corporate documents will need the stamp seal and signature of either a lawyer or notary public. Another Canadian corporate document that you may require for use in Ukraine is a Canada Revenue Agency Certification of Canadian Residency for Tax. Also known as a CRA Certificate of Residency, this document reduces and, in some cases, eliminates taxes on foreign income. It is also another document that proves your validity as a Canadian business to requesting parties in Ukraine. Like other corporate documents, your CRA Certificate of Residency will require notarization by a lawyer or notary public to make it valid for authentication at Global Affairs Canada. If you do not currently have your CRA Certificate of Residency for use in Ukraine, you can get it by following the steps when you click here. Once it has been notarized, you are ready to use our services; we can take care of the rest. For over two decades we have been assisting Canadians with their personal and professional affairs in Ukraine. We have helped thousands of businesses, law firms, construction companies, pharmaceutical companies, professional individuals, famous musicians, actors, and even former Canadian prime ministers. Our proud membership with the Canadian Chamber of Commerce, our A+ rating with the BBB, and our endless 5-star reviews on Google and Facebook are proof that we are the best in our industry. We are always striving to be better and set the bar higher. In our push to be the most accessible company in our industry, we have opened over a dozen service centers across major cities in Canada. If you live in or near Edmonton, Regina, Winnipeg, Toronto, North York, Mississauga, Halifax, Vancouver, Victoria, Surrey, Calgary, or Montreal you can use our service centers instead of the post office and receive free priority shipping via FedEx to our head office in Ottawa for the authentication and legalization of your documents. However, before using our service centers you must make an appointment with our head office in Ottawa. If you do not then your documents may not be accepted. Upon completion we can ship your documents anywhere in the world including Ukraine through one of our many shipping partners at an additional cost, or you can simply pick up your documents where you dropped them off. Don’t waste your time or money, hire the professionals at an affordable cost and see how easy we make it at ALSC. Click below to get started with your Canadian documents for use in Ukraine!